Carlos Carter (left), executive director of Homeless Children's Education Fund, stands with Joe Lagana, the founder of the group. The pair are celebrating HCEF's 20th anniversary this week. From that first revelation, Lagana created the Homeless Children's Education Fund as a learning center for homeless youth. It's since expanded to include 12 centers providing after school and summer programs, career readiness, college preparation and STEAM enrichment programs. Lagana joins HCEF's current executive director Carlos Carter to talk about the group's impact, how they're marking two decades of service and how the HCEF model works for similar nonprofits. Erin Rimmel of Mt. Lebanon drops off her glass recycling at a PRC pop-up collection event. Many municipalities across the region have stopped collecting glass at the curbside. Some communities in Pennsylvania are discontinuing glass collection as part of curbside recycling programs. 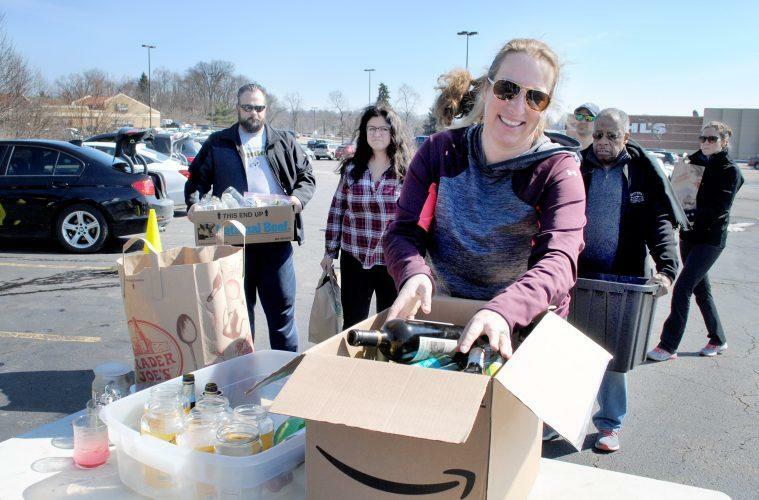 Kara Holsopple of The Allegheny Front reports that while this change came as a surprise to some residents, members of the recycling industry weren't surprised. Blue-Hots founder, pianist and vocalist Ian Kaine, percussionist Dan McMillan and vocalist Reenee Montiverde explained their unique Mad Men-esque blend of jazz and doo-wop and with 90.5 WESA’s Bob Studebaker. The Blue-Hots perform Friday at the Wallace Whiskey Room in East Liberty. And three years ago, a study by the Penn State School of Medicine found that a certain type of thyroid cancer was common to people who had been near the Three Mile Island nuclear power plant in the aftermath of the 1979 partial meltdown. As part of a look at Three Mile Island 40 years later, WITF’s Brett Sholtis reports on how the study has re-started the discussion around health effects due to the accident. Allegheny County Controller Chelsa Wagner and her husband, Khari Mosley, are being charged as a result of an encounter with Detroit police earlier this month, the Wayne County Prosecutor's office said Wednesday. Wagner has been charged with two felony counts of resisting and obstructing the police, and a misdemeanor count of disorderly conduct. Mosley faces two misdemeanor charges, disorderly conduct and disturbing the peace.